I consider myself to be a pretty lucky lady. I've won my fair share of prizes over the years. I've been lucky in love and have wonderful kids. I would have to say almost all that I've hoped for and dreamed for in life has worked out for me...so far. I wanted to share something I constantly remind myself that I am lucky to have. You're Jealous right? This old trailer and all it's boxes make me happy. In all these boxes are Roxy's stash of fabric. Roxy's was a friend of my grandma's. She lived with her for several years after my grandpa died. Roxy was a fabric hoarded. Not only was an entire trailer full of boxes but there were more in the granary. Roxy died a year or so ago and my grandma asked my sister and I if we wanted to go through the fabric before she donated it to the church. Last spring we spent a few hours one night transporting the boxes into the house and sorted through it. We found lots of treasures and lots of polyester. She had almost every kind of fabric you can imagine. plaids, felt, velvet, wool, corduroy, canvas, levi, wool, flannel, silks, vintage cotton prints, burlap, etc. The boxes were disgusting but she had everything tightly wrapped in plastic bags so the fabric was in good condition. I need to take some pictures of my loot, but I haven't taken the time yet. Here are few pieces I took pictures of that night. Every time I finish a project made with Roxy fabric I say to myself "Thank you Roxy!" 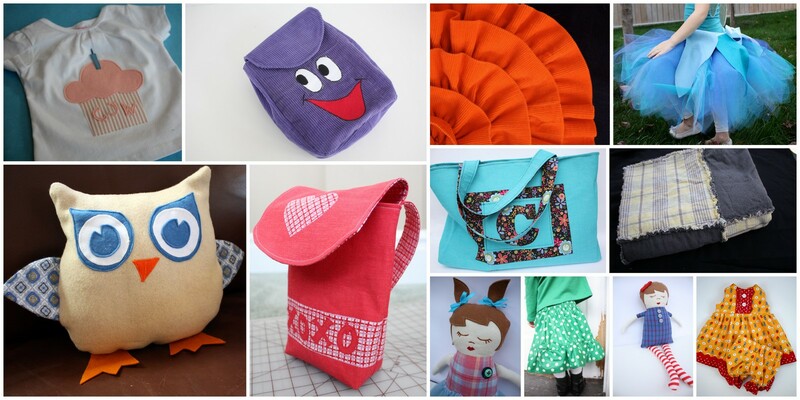 All of these are projects made almost entirely of Roxy fabric. My urge is to hoard the fabric especially the pieces I love, then I think of Roxy who never got to use the fabric she cherished. I'm lucky to have the fabric and I should use it. 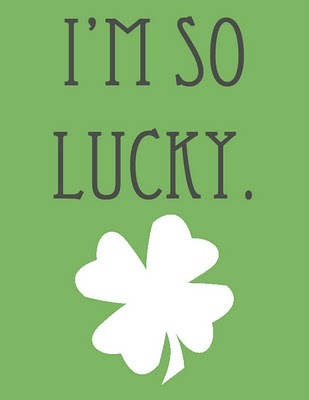 I hope you all are feeling Lucky today too. Hooray for the Roxys of the world, and for you who is putting it to good use. Wow...that is a lot of fabric - crazy!!! What a lovely post though, so true about wanting to keep things around but not using them. Looking forward to seeing what you'll be making with your new finds. I love that ROXY she hooked us up!!! Grandma and I have tied 6 baby blankets and have fabric to do another 30 all because of this lovely stash. I think there is still some out there in the granary. OH how lucky you are! That is awesome and TONS of savings in buying fabric. How FUN! I would be like a kid in a candy store...no pun intended. oh my, that is lucky! I'm sure Roxy would be happy to know that the fabrics are going to good use! You are lucky but I love that you are sentimental and thankful. You have been blessed. What a fantastic tale to tell for many years and for every time you make something with her stash...if only we all had a Roxy in our midst. 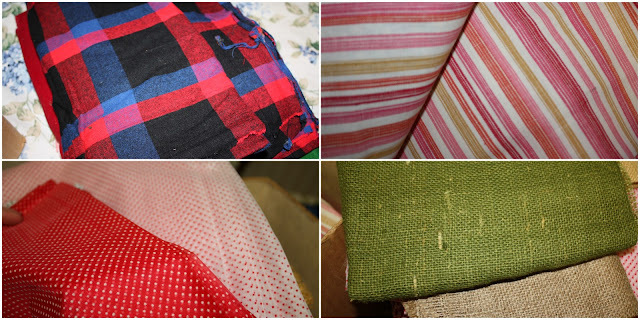 I can't tell you how many estate sales I've gone to where there were huge stacks of hoarded fabric and half-finished projects. Sometimes I will buy a quilt project and finish it, just because I like the pattern and it begs to be done. It used to be that you could make clothing cheaper than buying it. But now, prices of fabric have gone through the roof so that it's almost not worth it to sew. You probably have thousands of dollars worth of fabric in that trailer! I wish I were in on the Roxy stash. You should share the love with your fav. sister. That's awesome and so fun! What a great thing for you! I'm jealous! The possibilities are endless! What a lucky lady...and many lucky others who will be blessed by the things you create with them! Dang. You are VERY lucky! No wonder you have such adorable fabrics for your projects. That is a "pot o' gold!" So totally freakin' AWESOME!!! It's good to know that the fabric is finally being put to good use. And I swear that the pink/yellow/white striped fabric was my old bedsheets. Weird.